If you are in the market for universal flange type polyurethane bushings, you've come to the right place. If you are a fabricator needing a bushing to finish your design, this is the place to be. Or, if you've just come from your vehicle page and are needing a universal bushing, you're where you need to be. 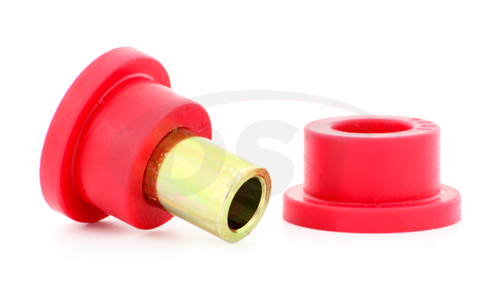 Energy Suspension's polyurethane is an excellent material for bushings. Resistant to chemical, oils, and weathering, poly bushings are far more durable than rubber and will outperform any bushing out there. If you are in the market for universal flange type polyurethane bushings, you've come to the right place. If you are a fabricator needing a bushing to finish your design, this is the place to be. Or, if you've just come from your vehicle page and are needing a universal bushing, you're where you need to be. So if you are having an issue finding a bushing for your specific needs, below is information to help you find a matching bushing from Energy Suspension's selection of universal flange type bushings. To obtain the first measurement you'll need to measure the length of the tube where the bushing will actually go inside. So this won't give you the total length of the bushing we need, just the length of the part of the bushing that will be inside the tube. Next, you will need the outer diameter of the bushing. 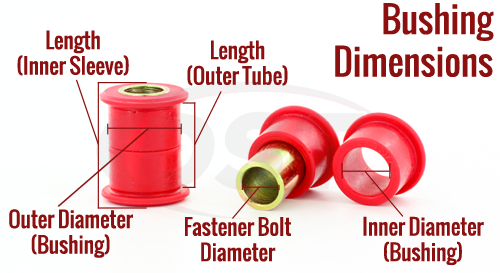 Now, most of you do not have the luxury of measuring the outer diameter of the bushing you will need. But don't worry, you can simply measure the inner diameter of the tube you are working with and that should give you the diameter of the bushing you need. Now the Length, or Sleeve length, will be the total length of the bushing you need including the flange. To measure the total length of the inner sleeve that your OE bushing has. If you don't have the OE sleeve that's okay. Just make sure you have the proper Bolt size for the sleeve to match your OE bolt size. If you don't have the bolts either, you'll be making a trip to the hardware store to get a bolt that matches the sleeve that comes with your universal bushings. If you have each measurement matched, but the bushing is too long, you can cut them down to match your needs. Once you have these measurements you can verify that this part will work for your application. 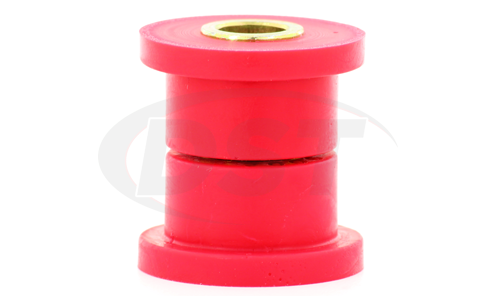 If you find that this bushing will not match your measurements, you can go to our Universal Bushing Page to find a bushing that matches your measurements.